Large Optically Correct Lens For Clear View. Integral Nose Cup Prevents Lens Fogging. 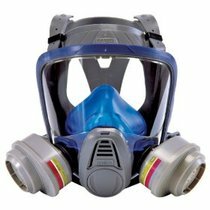 The MSA Safety Works 10041139 is a multi purpose respirator that protects against a wide variety of substances, including ammonia, organic vapors, chlorine, hydrogen chloride, chlorine dioxide, sulfur dioxide, hydrogen sulfide (for escape only), formaldehyde, hydrogen fluoride and methylamine gases.It is NIOSH approved under the new 42 CFR 84 respirator certification regulations.It is also approved to the P100 filter class.Its unique and sophisticated design offers comfort,great seal and clear view.